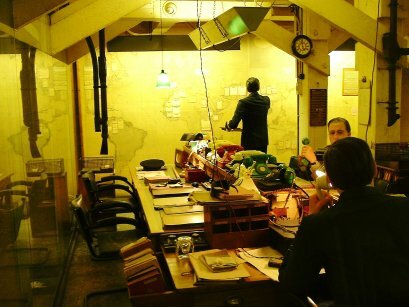 During the first months of World War II, under the threat of aerial attack by German forces, the British government established an operational command and control center underneath the Treasury building in the Whitehall area. The space was built as a heavily protected bunker under "the slab", a layer of concrete 1-3 meters thick. The large space, about 12,000 square meters, housed a staff of up to 528. It because operational in 1939, after Germany started World War II with its invasion of Poland on the first of September. The space was used as the Cabinet War Rooms through the Japanese surrender in August 1945 (Germany had surrendered in May). They were then closed down until being opened to the public in 1984. In 2005 the space accessible to the public was expanded into the Churchill Museum and Cabinet War Rooms. These are some pictures I took during a visit. For far more detail, see their web site. Winston Churchill communicated over secure links between London and Washington. For text communication, the exchanged messages through what the U.S. called the SIGABA cipher system, also variously known as the M-134-C, ECM Mark II, CSP 888/889, and ASAM VI. As used on the POTUS-PRIME link between Churchill and Franklin Delano Roosevelt, it was a much more secure crypto system than the German Enigma. See my page on cryptanalysis at Bletchley Park for more details on relative security of World War II cipher systems. 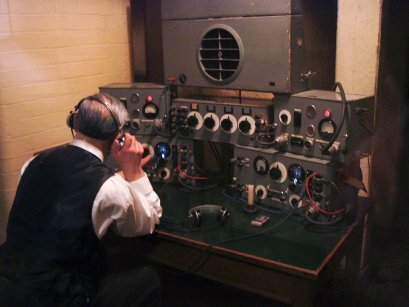 For voice communication, as recreated in this Cabinet War Rooms reconstruction, they used something designed by Bell Telephone Laboratories and called the X-System by its developers and operators and SIGSALY by the U.S. Army Signal Corps. SIGSALY broke the voice spectrum into six bands and quantized each into six discrete levels. That was then XORed with a random bit stream provided by a specially made recording disk. The receiving end XORed the received data with an identical key stream on a matching record. Each record, containing 15 minutes worth of key data, was used once and then destroyed. The SIGSALY hardware was so bulky that it had to be located in a subbasement of the Selfridge's department store, a few blocks away. A dedicated line was run from there to a small room in the Cabinet War Rooms. Other X-System terminals were built in Washington DC, North Africa, Hawaii, Australia, the Philippines, and late in the war after the Allies re-took France, Paris. For more details on the X-System, see "Secret Telephony as a Historical Example of Spread-Spectrum Communication", William R. Bennett, IEEE Transactions on Communications, vol COM-31, No 1, Jan 1983, pp 98-104. 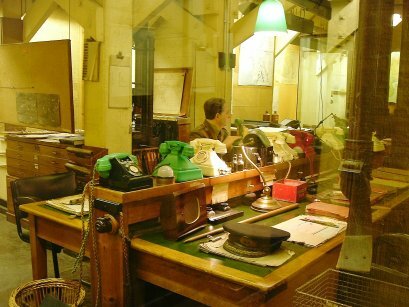 The BBC had a small studio within the war room complex for the radio addresses Churchill made while there. 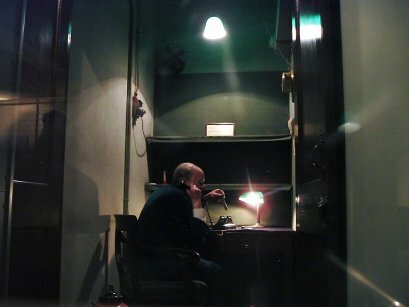 The map room had an array of telephones for gathering reports and communicating with Allied forces. Large maps covered the walls. Realistic manniquins complete the illusion! 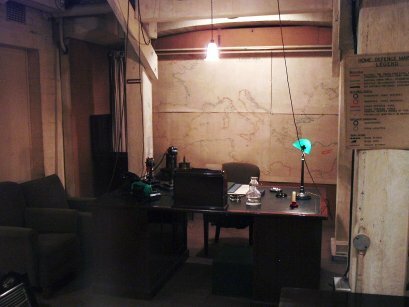 Churchill's office was simple but functional. Also see my picture of his private quarters. That's it for my pictures. For far more detail see the Cabinet War Room web site.